It’s a never-ending battle: the thermostat. Whatever the family dynamic in your home, it can be difficult to agree on the optimal indoor temperature during each season. The key to achieving the best compromise is to strive for efficient heating. Efficient heating means using less energy while still maintaining an even level of comfort throughout your home. She’ll be warm enough, he’ll be cool enough, and both will be happy with the energy savings. If you don’t already have a propane or oil furnace in Eden, you may want to consider this type of system. A lot of older homes have these furnaces, leading consumers to wrongly assume they are outdated heating sources. But heating oil and propane are still relevant in the HVAC industry for its many benefits. Efficiency. Heating oil burns hotter than natural gas, meaning your furnace makes significantly more heat with the same amount of fuel. Comfort. Since oil burns hotter than other fuels, it provides an even, long-lasting heat that gives you a higher level of comfort throughout your home. Everyone will feel consistent warmth wherever they are in the home, meaning the thermostat war can finally end. Availability. Not every home has access to natural gas lines. Heating oil is a readily available alternative where gas isn’t feasible. In recent years, natural gas shortages have caused prices to skyrocket and customers to worry. Heating oil has not been in scarce supply, keeping prices reasonable and oil customers happy. Safety. Oil exists in a liquid, non-flammable state in a tank on your property. To become flammable, it must be heated to at least 140 degrees to convert it to a gas, meaning it is an extremely safe heat source. Cleanliness. Heating oil and propane have come a long way in terms of its clean burning properties. With proper furnace maintenance, they release less pollutants. Furnace longevity. Propane and Oil furnaces simply last longer than many other heating systems, averaging 30 years or more with regular maintenance. The key benefits of propane or heating oil that help end the battle of the thermostat are the first two listed: efficiency and comfort. Heating oil burns really hot, which means your oil furnace in Eden requires less fuel to create the same amount of heat as other fuels. If your system is well maintained for optimal efficiency, then it should eliminate cold spots and maintain a consistent temperature throughout your house. Thinking of switching to propane or heating oil for their many benefits? Contact Carolina Fuels for a recommendation on a new propane or oil furnace and save on fuel delivery and furnace maintenance. Call (336) 273-8663. 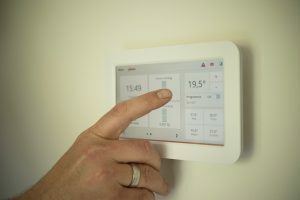 How Your Old Thermostat May Be Costing You Money What’s that Smell Coming from my Furnace?